A Step by Step Audio Podcast on exploring your creative talents and pursuing excellence as a Professional Artist. Audio download + accompanying transcript eBook. 1 hr. 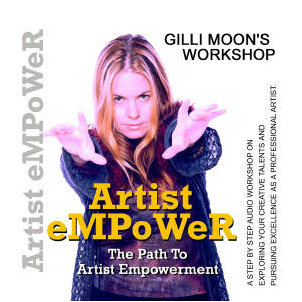 Gilli Moon, artist, songwriter and author, hosts artist empowerment workshops encouraging, motivating and providing solutions for artists and arts business professionals. 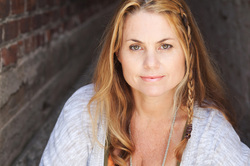 This live recording captures her Artist eMPoWer Workshop that she conducted to an audience of artists and musicians at the Musicians Institute in Hollywood, California. This is a step by step audio workshop (+ accompanying transcript eBook) on exploring your creative talents and pursuing excellence as a professional artist. For artists of all genres who have chosen the professional path, practical steps in harnessing one's creative abilities to succeed and survive in the Arts and enjoy one's artistry at the same time, Gilli Moon's Audio Podcast: Artist eMPoWeR - the Path to Artist Empowerment - combines a self-empowering practical guide in surviving and succeeding in the Arts with key business principles and spiritual nourishment. Listening to the Audio Podcast (+ reading the accompanying eBook), it'll be like you were there with Gilli. Play it in the car, or before going to bed, while you work, or sit intently. No matter the place, whether you are a student, or a full time professional artist, this workshop will take you on an artistic journey of self-empowerment, self-discovery and powerful marketing and business lessons. Enjoy the listen, read and ride!